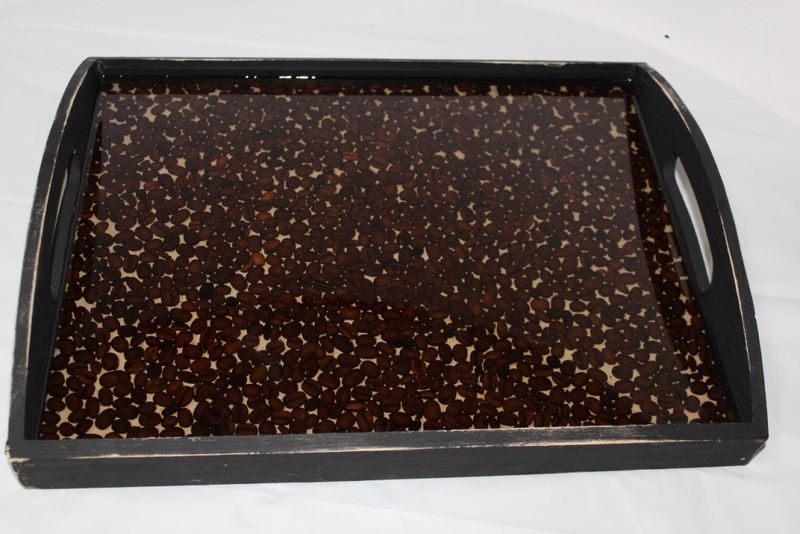 In September I shared a Resin Coffee Bean Tray that I created with EnviroTex Lite...I loved the concept of that tray so much that I am making more resin trays. 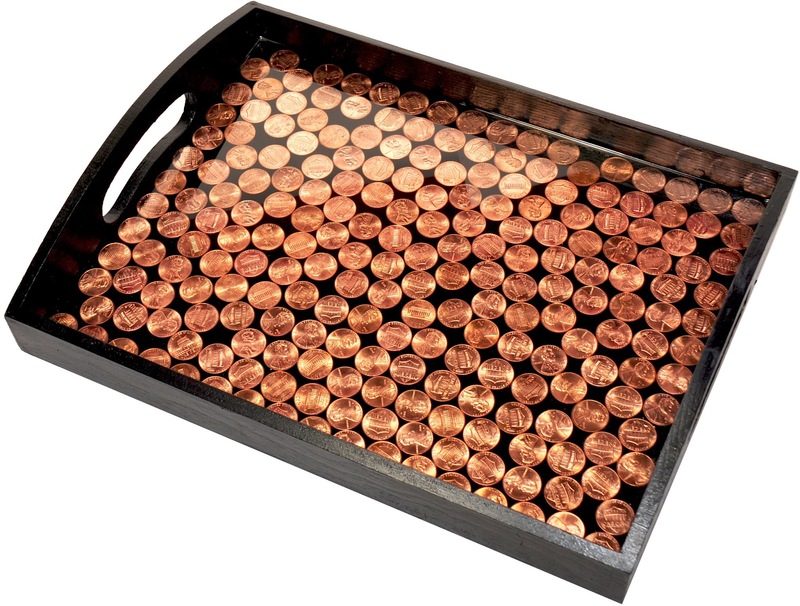 With the holidays coming up, I think these would make perfect gifts!Today I am sharing with you a Resin Penny Tray. This would make a great gift for a coin collector, don't you think? Paint the entire tray inside and out and letting it dry. 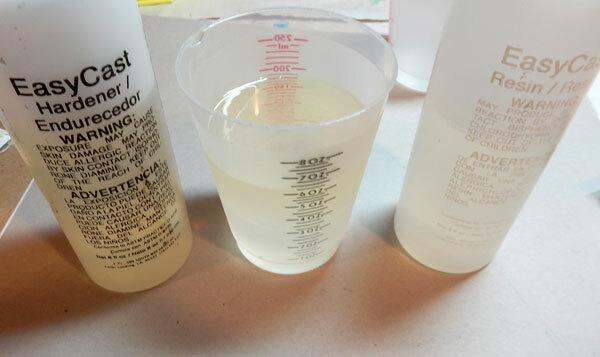 Measure equal amounts of resin and hardener, mix together for two minutes.Pour mixture into new cup and mix for one minute. Fill the bottom of the tray with the pennies, I did not mind some showing heads and some tails:0)Then pour the EnviroTex Lite over the pennies.Use a lighter to remove any air bubbles that rise up, I did this every 15 minutes for an hour. Mix some more EnviroTex Lite. Pour into the tray. Use a lighter to remove any air bubbles, let dry 12 - 24 hours. Hello, my dear crafty friends, Irit Shalom here today! I am going to share a set of accessories that is totally hand made. This set includes a necklace, a ring, a pin and a hair clips and all are made from bits and pieces and some- a lot- of ETI casted flowers and leaves and a lot of paints over. First- the resin pieces casted in molds. I used a lot of old molds I own and mixed up 4 oz of Easy Cast Resin- that's 4 oz of resin and 4 oz of hardener (mixed according to manufacturer's advice) and it made a total of 8 oz that was a lot! of liquid resin to make all different colors for casting., as you never want to waste even a drop of resin. I used ETI TRANSPARENT resin dye in green, amber, red and yellow and added a small drop of the dye into 4 different small plastic glasses where the mixed resin was already added before. Then I casted the molds and let them dry for a few long hours. Now that's what they look before painting over: nice casted transparent pieces in 4 colors. I wanted to add more color to them so, I grabbed some old acrylics in fall colors and colored the casted piece over to make them shine. Then I made all my finished projects. Here you can see the hair clips the ring and the outfit pin. And this is the necklace made with a painted chipboard and all big casted pieces glued with hot glue to stay in place. 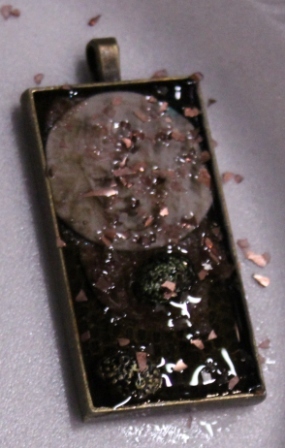 I covered the back side of the chipboard with a thin layer of ETI resin to make it water proof and wearable. Happy fall and Happy Thanksgiving to all my American friends! Hello friends! Larissa here today showing you how I made this Resin Day of the Dead necklace. Clear Casting Epoxy into the mold, I let it sit to the side for about 24 hours while I worked on other projects. The skulls popped right out. Then I started decorating him by adding rhinestones for his eyes and then made a crown of flowers for the top of his head. By adding a few beads and a ribbon chain I was able to create a fun necklace to wear to celebrate the Day of the Dead. I think you could wear this necklace any day though since sugar skulls are very popular. You could really made these any fun color too. I hope you enjoyed my post today. Thank you for stopping by and don't forget to check back to see more fun tutorials using ETI.USA products. Have a wonderful day friends. To see more of my work you can visit me at Muffins and Lace. one was this pumpkin silcone mold for candy...it came packaged with two of them, so the first thing I did was mark the back of them, one with Craft Room, the other I marked Food Safe. This is so that I would have one to use in the kitchen if I ever wanted to, as once you use molds with resins and clay, they would no longer be food safe, so this is an important step. I thought I would make some resin pumpkins for thanksgiving but first I wanted to try the molds with EasySculpt® Self Hardening Epoxy Molding Clay. I started by spraying the mold with Mold Release and gathered my supplies. I measured out equal amounts of of A and B.
I mixed them together until I had a uniform color. I placed the mixture into the mold. I pushed the clay in firmly. I wanted to use the back side of the mold, as I did not want the faces, I only wanted the pumpkin shape.I applied glitter to the back side. I used orange for the pumpkin and green for the stems...I rubbed the glitter in a bit with a paint brush.I let the pumpkins set up for about 30 minutes...which made it easier to remove them from the mold. I like how they turned out...this was a quick and easy project! 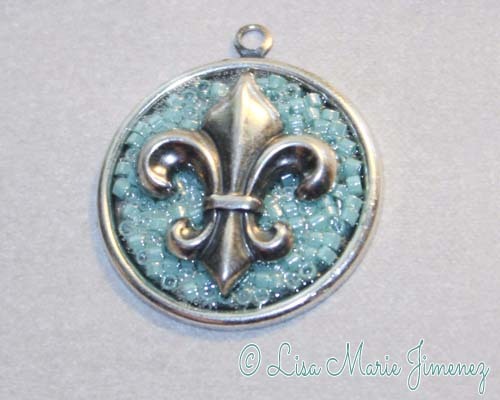 Hello ETI resin fans, Lisa Marie Jimenez here today, to show you how to make this Fleur-de-Lis Bezel Charm. This charm is one of my favorite charms to make and I use this style charm in my own jewelry designs. 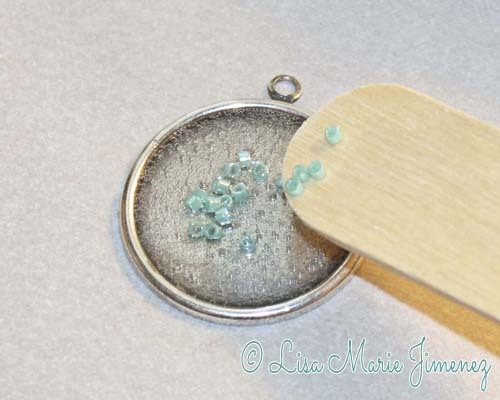 Making this charm is easy using ETI Jewelry Resin along with seed beads, a charm and a bezel. First mix the ETI Jewelry Resin according to the manufacturer’s instructions. 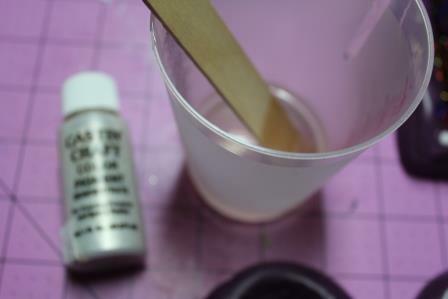 Use a clean wooden stick to add a thin layer of resin into the bezel. Next, add the seed beads slowly into the bezel. 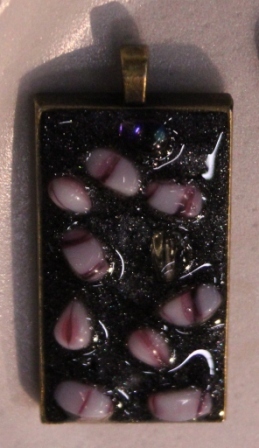 Dumping the beads all at once into the bezel will cause the resin to “splash” up onto the sides of the bezel. 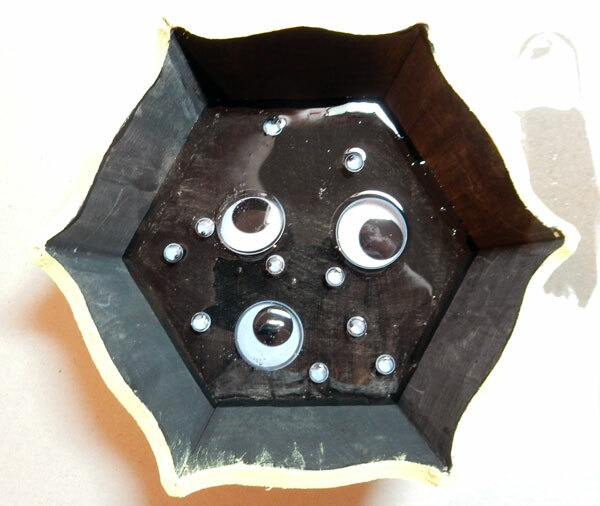 As you can see, I have not removed the bubbles from the resin prior to adding the beads. I have found that when adding the beads, this will cause more bubbles and release some, so I wait until I am finished adding the beads to remove them. Use a toothpick move the beads around in the bezel to cover the entire bezel and to flatten them down. Add more beads as necessary to fill the bezel. 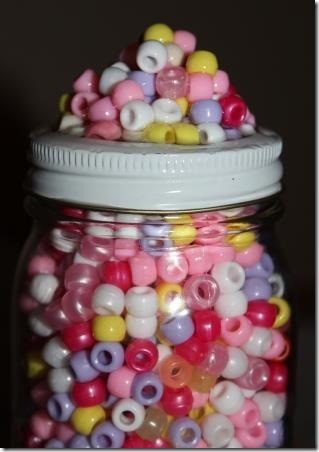 Once again flatten the beads down, so you have a smooth layer. 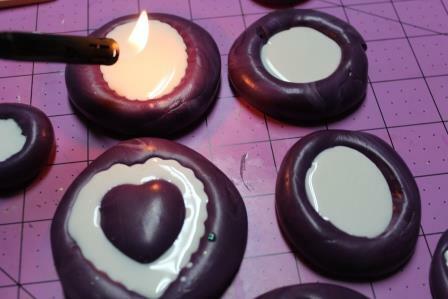 Now you may remove the bubbles from the resin using a lighter. Wave the lighter over the bezel a few times. 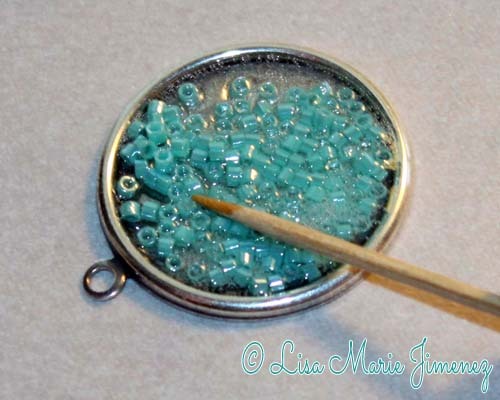 Add a charm (ring cut off) on top of the beads. Use a toothpick to arrange the charm so that it is centered. 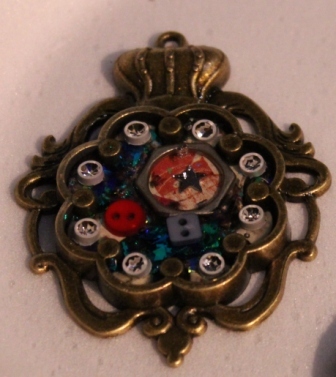 Next, add another layer of resin on top of the beads, going around the charm. I found it best to use a toothpick to add the resin for this step. Remove any bubbles with a lighter. Allow the resin to cure. 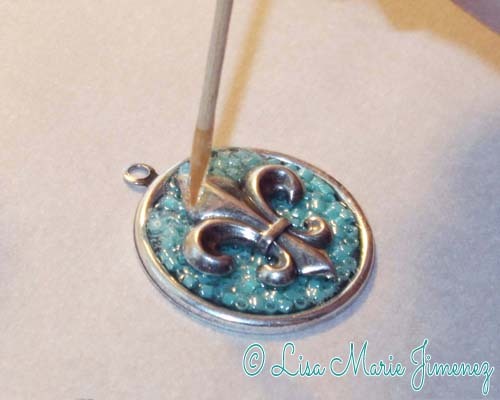 Your Fleur-de-Lis Charm is finished. This charm is ready to be used on a bracelet or necklace. The possibilities are endless, as you can use different bead colors and charms. What will you fill your next bezel with? Thank you for stopping by today, I hope you enjoyed my blog post. To see more of my jewelry and craft tutorials please visit my blog. 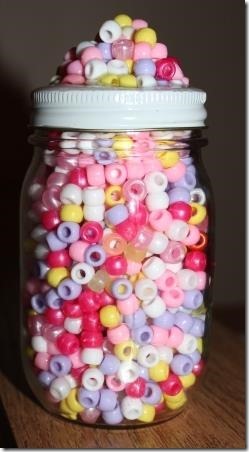 Today I am sharing another Jar Topper, this one is with Pony Bead. I measured 1/2 ounce of the resin and hardener from the EnviroTex Lite®.I poured them together. and mixed for a full two minutes. Then I poured the mixture into another cup and mixed for another minute. I poured some of the resin mixture out onto the jar topper. Then I added more resin and let it dry for 12 hours. Then I mixed up some more resin and repeated the above steps...3 more times. To get the height I wanted...I could have gone higher as the resin is solid.What would you put on top of a jar topper?Let me know in the comments below. Mix your resin according to manufacturers instructions and pick the color you would like to use. Simply add a small amount and mix into the resin. Now you have wonderful resin pieces to use in projects. While these items are white, and you may have wondered, what in the world would you do with them...first of all I was testing how the white pigment would look in a completed resin piece knowing that white would be a good base color to go over once I decided what to do with these pieces. I thought I would share what we did with the cameo when my mom was visiting last month... First we used Iridescents Sheer Silver to add some color. This is a very sheer medium and a touch of the white shows through which is perfect. Once dry we added just a touch of Rub and Buff to some of the raised areas. I love to preserve memories in items that can be seen and used. I found some inexpensive beaded compacts recently while shopping and knew they would be perfect for a memory project. I got out a tweezers and started by removing all of the micro beads.There was also adhesive that had to be removed.I then cleaned the surface. I printed out my parents wedding photo and applied a layer of Ultra-Seal to the back and let it dry.I then applied two layers of Ultra-Seal to the front of the photo, letting it dry in between coats.I I cut the photo into the correct size circle for the compact. Then I glued it into the compact with some of the Ultra-Seal. I measured out equal parts of the resin and hardener of Envirotex Lite into two cups. I mixed them together for two minutes. I then poured the mixture into another cup and mixed thoroughly for one minute. I poured the resin onto the photo, being sure not to go over the lip of the compact.There were a coupld air bubbles that come to the the top, so I used lighter to remove them. I placed some crystal trim around the outside edge of the compact.I should have waited for the resin to set up a bit before doing this step...as I had to adjust the trim several times to keep it in place, but once3 dried the resin acts like a glue and the crystals stay perfectly. Although this photo does not do it justice, I love how this project turned out. A bonus to this project was that my mom was here visiting (as she lives in Florida) and able to see the process and help with this project which made it even more special and a perfect gift for her to have as a keepsake. Hi There! 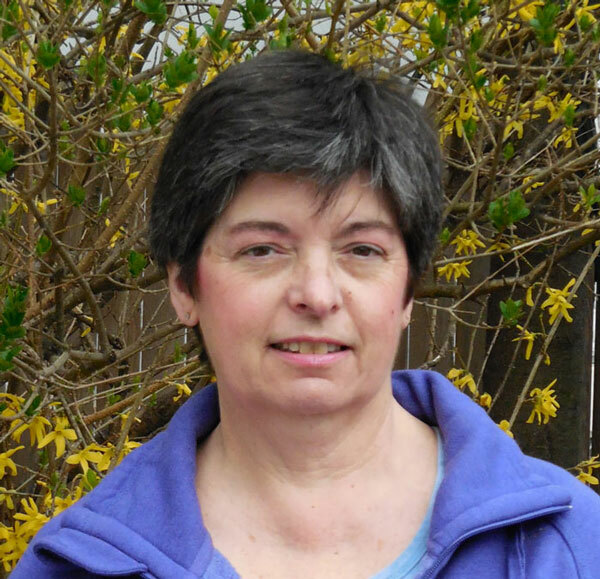 My name is Karen Bearse & I am new to the ResinCrafts team of guest designers. I am very excited to be a part of this team as I love, love playing with resin. Some of the ETI products are new to me so we can get to know them together. For my first few posts I will be doing a series on creating and designing with resin and paper. These 2 are a match made in crafting heaven! I will also be doing some posts where I use the resin/paper I make so stay tuned!!! Here is what I started with. 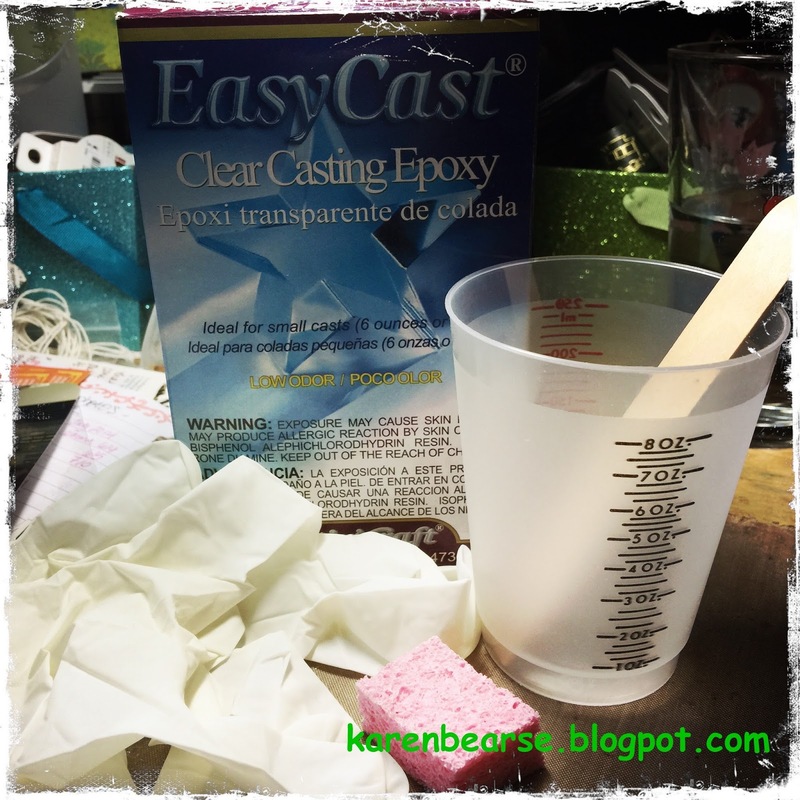 The EasyCast clear casting epoxy, rubber gloves, measuring cups with stir sticks, a piece of kitchen sponge. 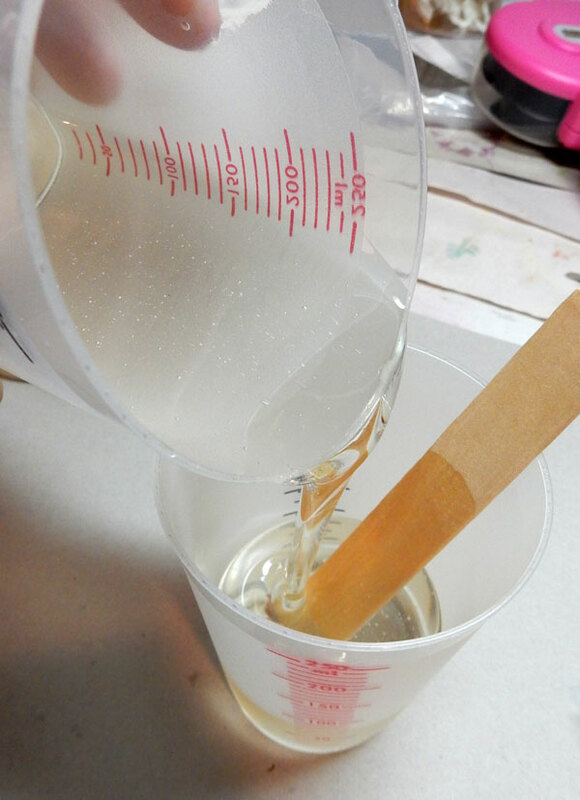 I simply followed the easy directions to make the resin - read the instructions for full info- pour 1oz each of resin and hardener and mix together with the stir stick for 2 minutes, then pour into a 2nd new cup and with a new stir stick, stir for 1minute. With this project we don't need to be concerned with bubbles. 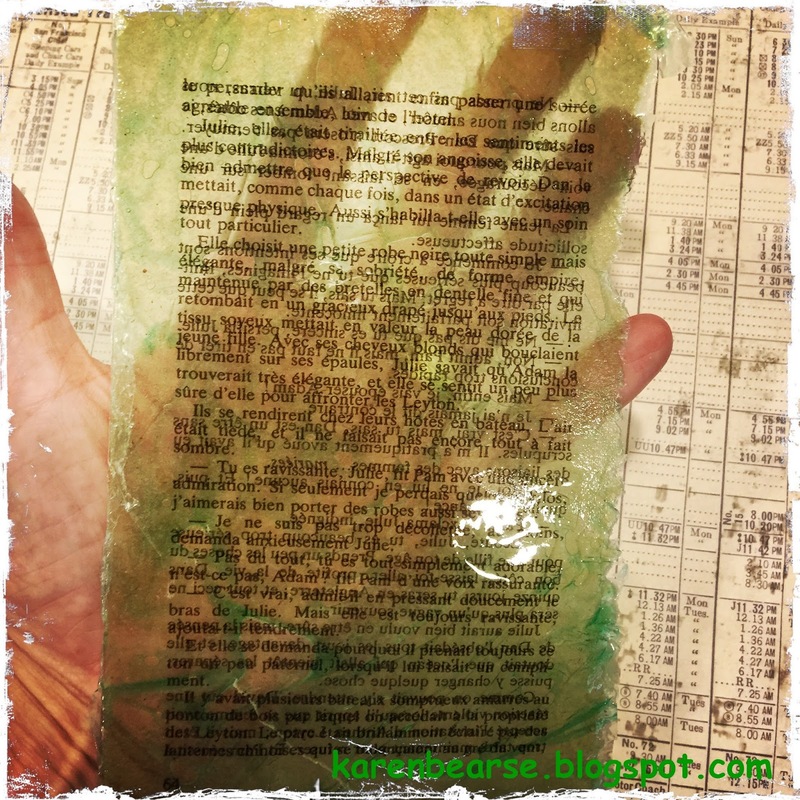 Use a cut off piece of kitchen sponge & gloves apply a thin coat of resin to each side of paper and than set aside to dry overnight. I used tissue paper, book paper and paper napkin as my substrate, each turned out very differently. This can be a bit messy but trust me is worth the results! You do have to be careful what surface you set your piece to dry on, so read on. First the tissue paper- this was probably the coolest. I used a beige piece of 7gypsies tissue paper and ended up with a completely translucent piece that was much like a piece of light composite mica used in collage etc. It made the tissue paper stronger with a plastic finish but it will still tear. Next up a paper napkin. I did not pull apart the layers but left it in one piece and applied my resin. This piece is less translucent, sort of like a frosted glass but is much stiffer. It can be torn but not as easily. It feels even more like a plastic than the tissue paper. The next piece was a learning moment. I used a piece of Asian book paper that had a bit of a glossy finish. I left it to dry on a piece of plastic garbage bag. The bag would not remove from the paper and I had to leave it attached and cut it out. 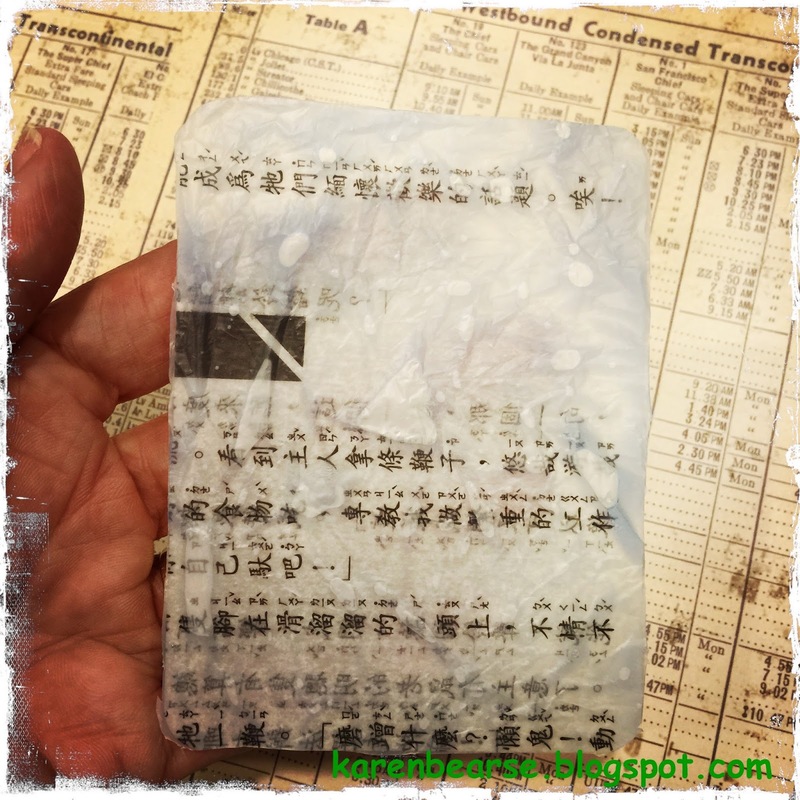 The resin/bag/paper is a lot like a lamented piece, is hard to tear and the bag is bubbled and crunchy on the other side-hum could be interesting. Here is the backside, you can see the bubbles in the plastic where it did not adhere to the paper. Yet the front side is very smooth. Lastly I took a regular piece of book paper. I added a drop of green transparent dye in the final mix stage. 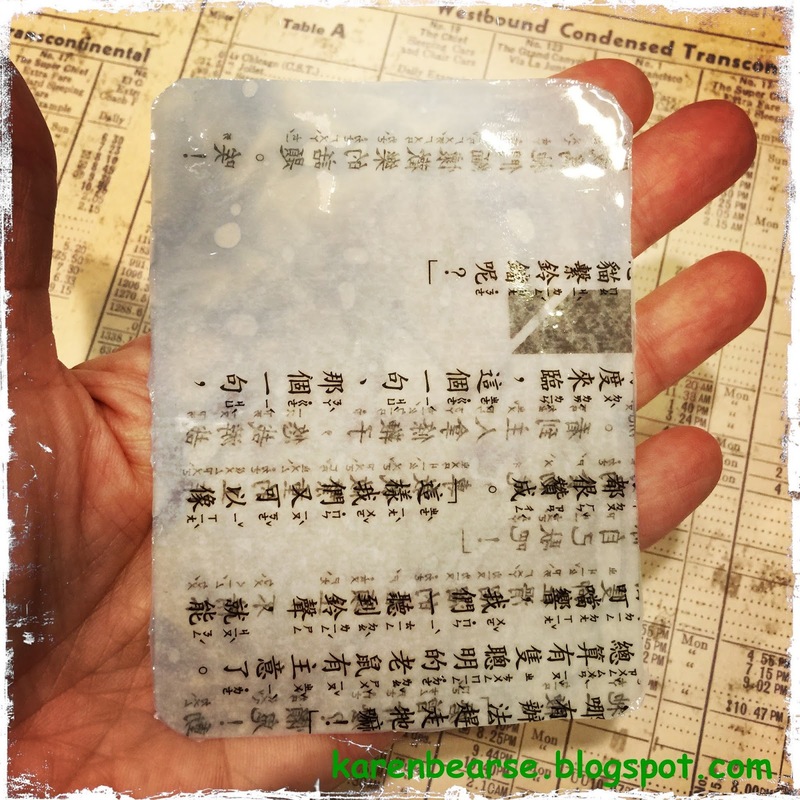 The resin made the paper translucent, in fact you can see the back page of the writing through the sheet. The ink gives it a tinted look but doesn't take away from the translucency- very cool! I had put this piece to dry on a different store plastic bag & while it did peel away from the bag it left the back side embedded with the creases from the bag. I learned a great deal with this simple process so lets just finish with some tips. a)I was tempted to touch the resin/paper after a few hours just to test- this resulted in a very sticky finger! Let dry over night to prevent sticky fingers! b)The best surface to let your paper dry is the non-stick craft sheet by Ranger. Once dry it is very easy to pick up the resin/paper. You can easily clean your craft sheet by scrapping off any resin that is left. 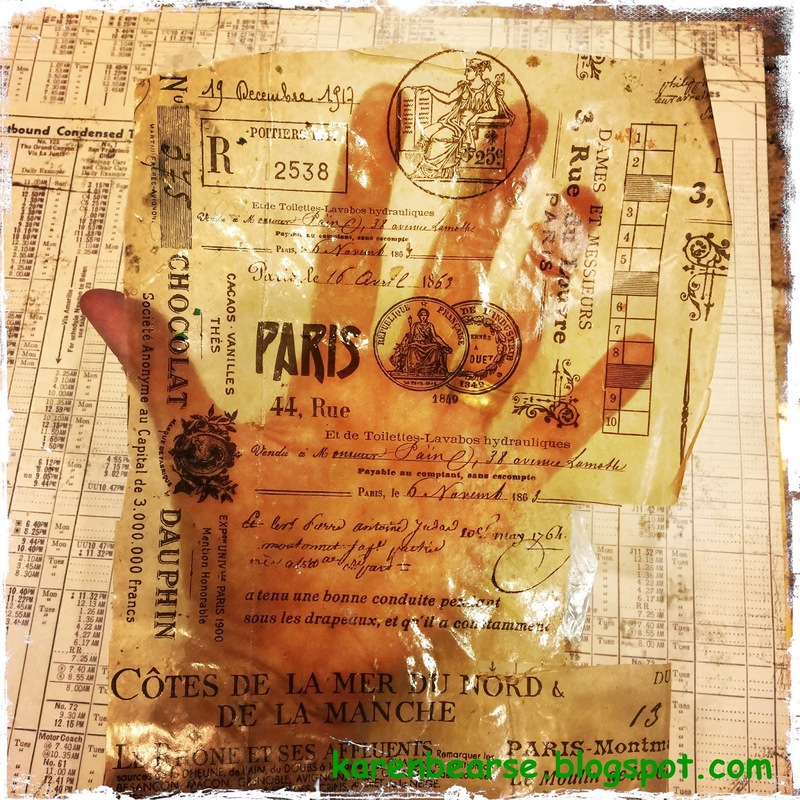 I tested both plastic bags and wax paper and the results were not as simple. One of the grocery store plastic bags adhered to back of the paper while another one didn't- no idea why. The wax paper fared a little better but it was tough to peel off in places. I think if you pick the resin/paper up once it is partially set and set it back down it might be easier. I will test this theory next time. For me I just went and bought a second craft mat! c)applying a heavier amount of resin gave the paper a more plastic like feeling that was almost impossible to tear-fun! d)if I pulled away apart the layers of the paper napkin and only used resin on the image piece my resin/paper was translucent and reacted much like tissue paper. 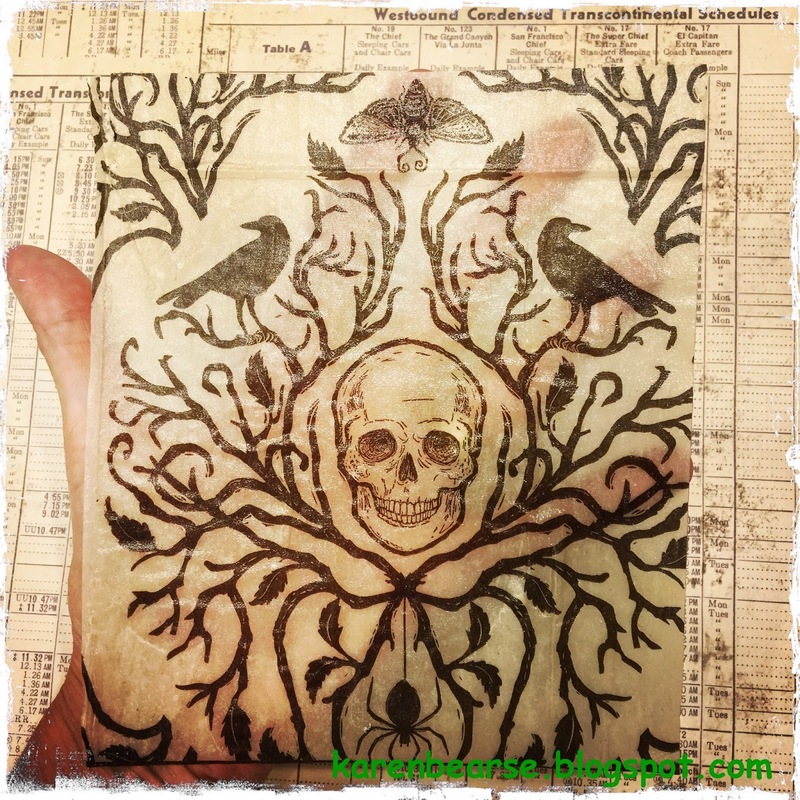 You can use your resin/paper for cards, art journal to die cut images the list is endless. Join me next time as we further investigate resin/paper! Hello, my dear crafty friends, Irit here, and welcome to my October project made for ETI blog. This time, I really messed up at first, but then those lemons gave me a great lemonade. So here is a story about my mess up. I wanted to make some amber color resin trinkets and beads and I was thinking about the amber part that I already casted in the past. 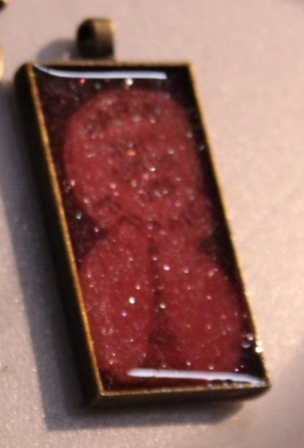 1.So I mixed a pretty large portion of Easy Cast Resin , like maybe total of 6 oz (3+3 of each part) and then in a second of bad lighting I added Transparent Red dye into the whole mixture. 2.So now it was a kind of red and you don't have much to do, but to put it into your molds and to think it over when it's dry. And you don't have a lot of time to pick your molds or to use your Mold release. You need to move and move fast. So I picked two molds that don't need any release medium and just filled them with the red transparent resin. 3. After like 24 hours those pieces were out and in a great, still red shape. 4. But as this red seemed to for me and not interesting I decided to try gold paint that I had in my stash. A few of them were to light and not seen. A few were too thick and not nice looking over the resin. And then it was like " BINGO": very old, maybe 8 years old Spanish liquid gold paint and it was a HIT! 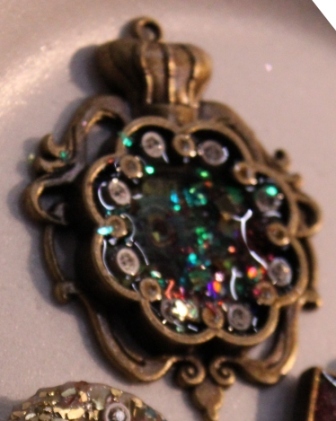 Just two seconds to dry over resin pieces and look how gorgeous this golden coverage looks! And just to add: I just Googled this company. and after 3-4 tries with well known USA companies this Spanish gold is GOLD and available if you are interested...not a plug for the company, just information for you! 5. 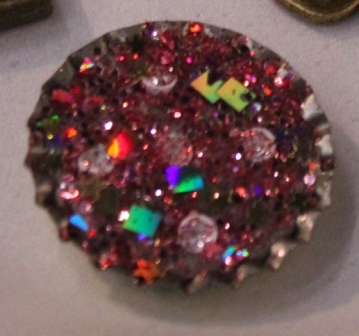 As a next step I just arranged my red- gold beauties into some wearable/useful trinkets.Some were made as pendants. Some were made into magnets. One was done into a staple book mark. I also painted all metal parts I used with the very same liquid gold and as you see it looks like a real thing. Each piece here was glued with a small mix of the very same ETI Easy Cast Resin and I added the same clear resin into this trinket with white pearls on the bottom. Now that I know how to make this golden glaze over resin pieces, I am sure I will use all other pigments colors and will have a nice trinket collection to use with my future projects. In the last two post I have shared with you a workshop I taught at the Bella Crafts Connections at Mall of America last month. 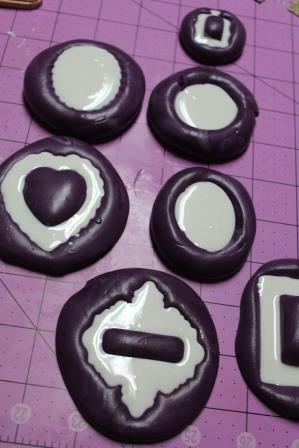 Today I am sharing what the students created using the Jewelry Clay. a Free Form design...this one the student created and was going to let it dry, then paint it. 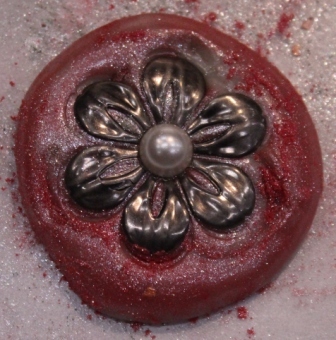 This one was cut with a round cutter (like a cookie cutter),then Iridescent Powders were added anda button put into the center....by leaving this to dry complete the button and pwoderswill remain in tack...this product is so cool!! 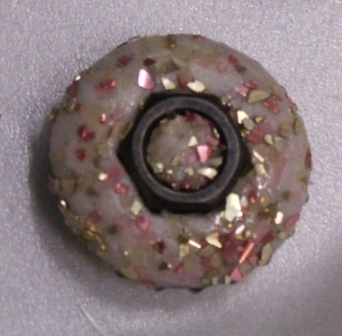 Here the clay was overfilled into the bottle cap,chuncky glitter was placed on top anda bolt was placed into the center. 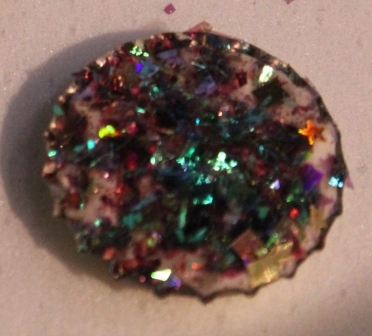 This one was the clay was placed into a bottle cap with crystals addedand glass glitter on the top. 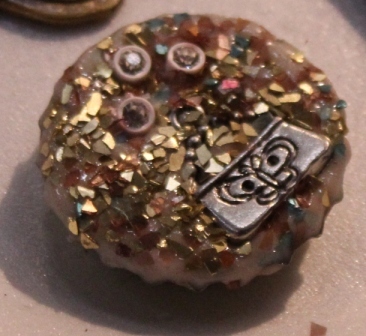 Here the clay is put into a blottle cap with a few crystals added,a charm and chunky and glass glitter placed on top. 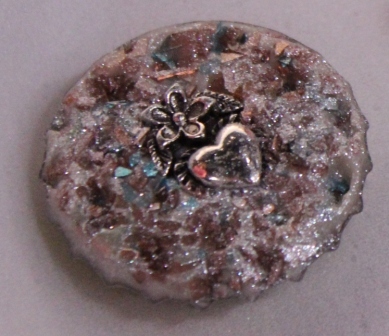 I think this piece has such great sparkle...the clay was placed into a bottle cap,and several colors of chunky and glass glitterwere added to the top...so simple yet it has a wow effect! 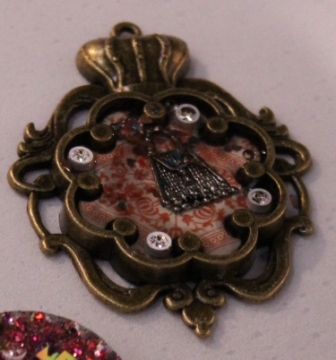 Here is the last piece I got a photo of...it has an assortment of charms, with glitter pressed into the clay,I believe it has both chunky, glass and ultra fine glitter and finished with Pearl Iridescent Powers. I hope you enjoyed seeing the creations of several of the students in the last three post! 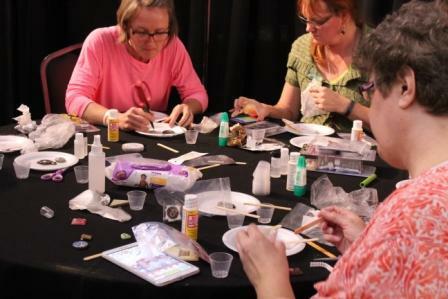 Last Friday I shared the first part of one of my workshops I taught during the Bella Crafts Connections Craft Retreat at Mall of America using ETI Jewelry Resin and Jewelry Clay. Today I will share the 2nd bezel the students worked on during class... I brought extra bezels for the workshop so that the students could try something totally on their own...they did and they had fun!! They started by measuring equal amounts of the jewelry resin, mixing them together and stirring for 2 minutes. Then pouring into a second cup and mixing for another minute. 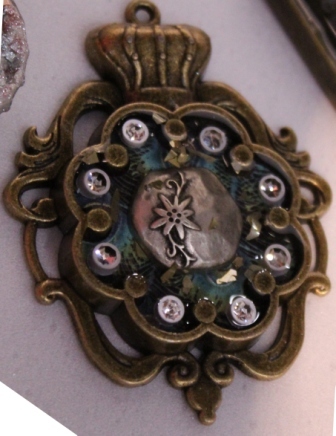 This mixture was then set aside so they could decide what to put into their bezels. I showed the students what the resin looked like with a small amount of Iridescent Powders added to give them the beautiful results you can get by adding just a bit of the powder (the photo above shows an example of what the powders look like with the resin). 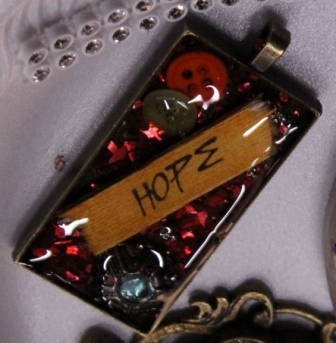 For the second project simple brass rectangle bezels were used...Here a stamped popscile stick, a charm and glass glitter was used. Crystals and glittered resin was used here. 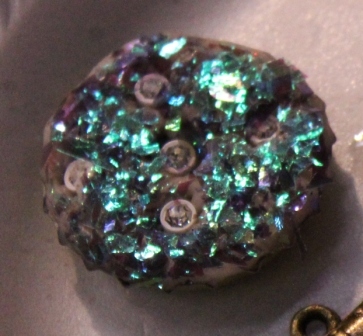 Iridescent Powders with the resin and some beads were used in this bezel. 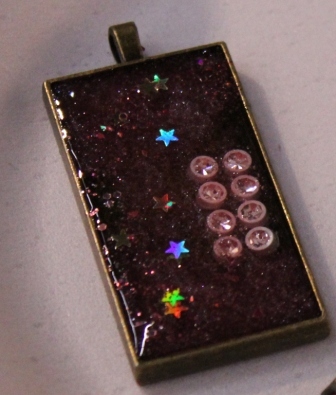 A photo and glittered resin are in this bezel. 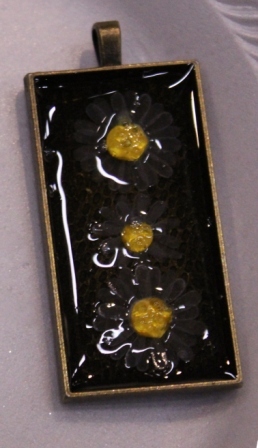 Small flowers and colored resin were used here, I believe the resin was colored with Iridescent Powders, but I am not 100% on that. 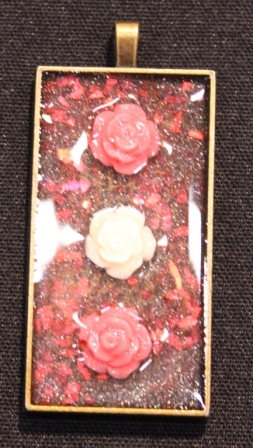 Flower charms, glitter glass and glittered resin were used here. 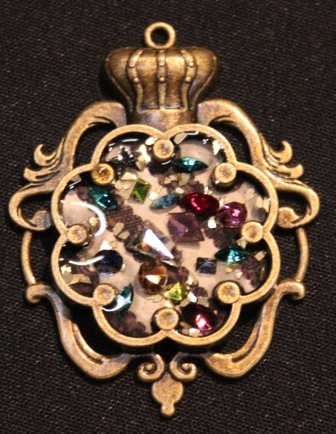 Some charms and glitter glass are used in this bezel. On Thursday I will share what some of the students created using Jewelry Clay. This past week I was at Bella Crafts Connections Craft Retreat at Mall of America...and one of the workshops I taught was using ETI Jewelry Resin and Jewelry Clay with Bezels.The workshop was scheduled for 2 hours and the students completed 3 to 4 projects each. I am going to divide the segments of workshop into three blog post to showcase what the students created.... 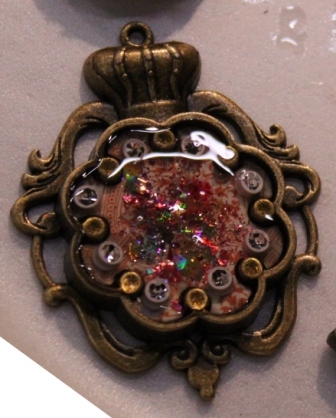 This is a workshop that Kristi Parker was originally going to teach and was unable to make it to the event, so this first project is one she designed using ETI Jewerly Resin, a Spellbinders Bezel and matching die. To get started the students measured equal parts of the resin and hardener, mixed them together and stirred the mixture for 2 minutes. Then poured the mixture into another cup and stirred for another minute. Then they set this aside while they decided what to put into the bezel. and more before pouring the resin mixture into the bezel. Above are a few of the finished bezels from the students....they all turned out great and each unique in there own way. What can go into a bezel? You may ask. Well, almost anything as long as you can fit the items inside of the bezel and ETI Jewelry Resin will hold the items place. I measured out equal parts of the resin and hardener. I then poured the mixture into another cup and mixed for another minute. 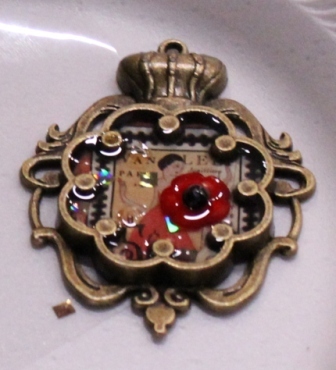 I placed the stones into the bezel and added the resin.It did not take much, and I was careful not to overfill.There were no air bubbles that came up to the top, but if there had beenI would have simply blown them away, with a heat gun. I simply added a ribbon to finish it off! 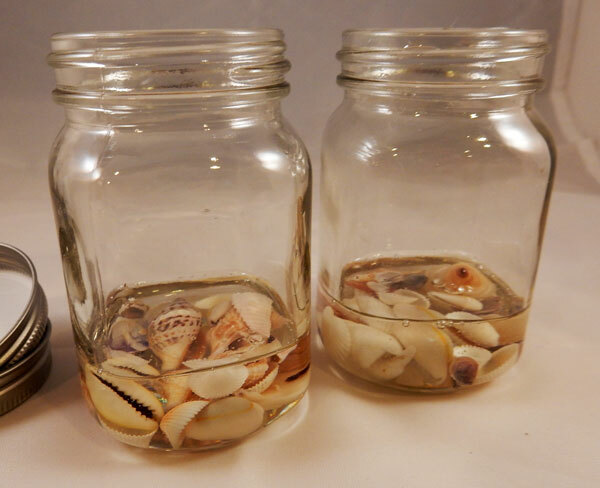 Hi everyone Steph Ackerman here using EasyCast Clear Casting Epoxy from Environmental Technology Inc. What do you do with all those shells your family collected from the beach all summer? Do you put them aside or perhaps discard them when no one is looking? 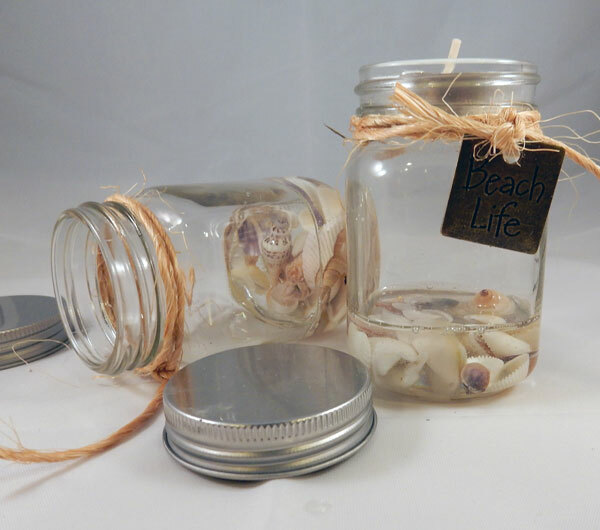 How about embedding them in resin so you have a permanent reminder of the summer. 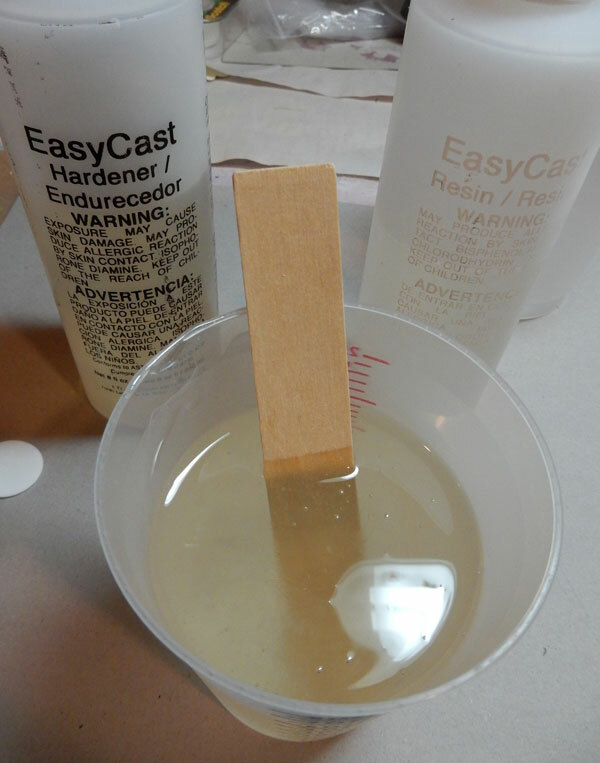 Begin by mixing equal parts resin and hardener. Mix for 2 minutes scraping the container to mix all the resin together. 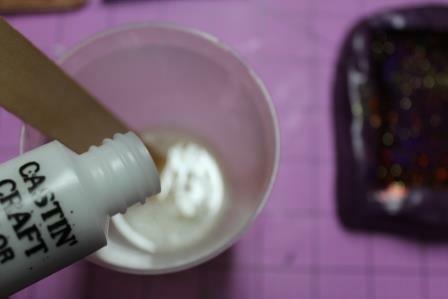 Next, pour the resin into a clean container and mix for another minute. Pour about 1" of resin in the bottom of the glass jars. Start by painting the inside and outside of the box, let dry. Repeat. Use the paper trimmer to cut card stock 1/4” smaller than the top and sides of the box and lid, use Mod-podge to adhere to the box. 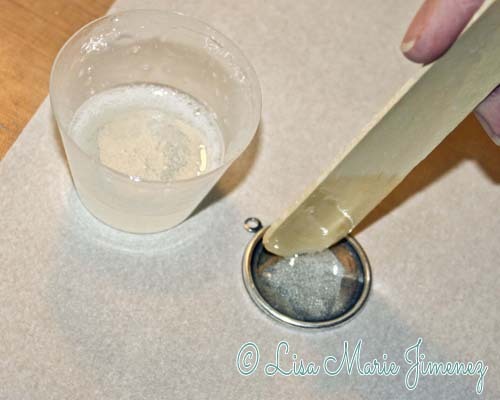 Measure equal amounts of resin and hardener, mix together for two minutes. Pour mixture into new cup and mix for one minute. Add a drop of Blue to resin, stir thoroughly. 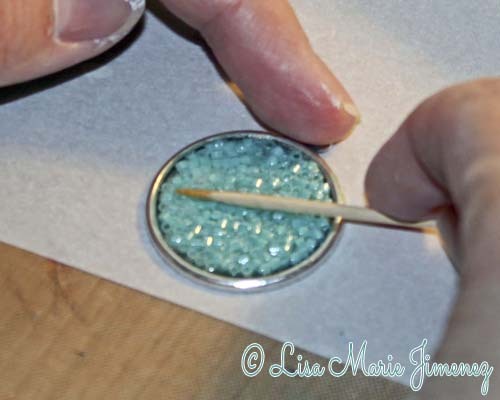 Add a touch of glitter to resin, stir thoroughly. Pour resin into mold, blow on any air bubbles if needed, let dry 12 hours. Repeat three times. Rub a touch of gold onto resin pieces. the additional pieces as shown in main photo. Paint inside and out side of tray with Country Twill, let dry Paint entire tray, except inside bottom with Licorice, let dry. Sand away areas of the tray to let the Country Twill show through and to give a distressed look. 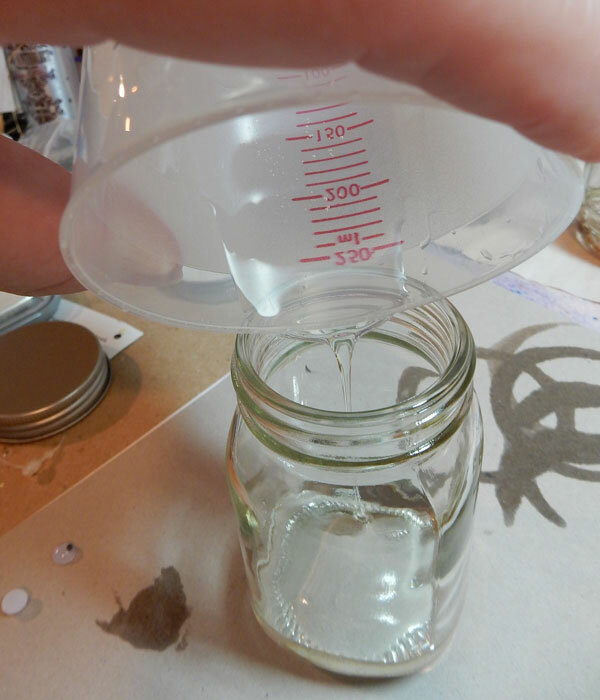 Measure equal amounts of resin and hardener, mix together for two minutes. Pour mixture into new cup and mix for one minute. Then add coffee beans in the bottom of the tray. Use heat gun to remove any air bubbles, let dry 6 hours. Mix some more resin, then apply over coffee beans. Use heat gun to remove any air bubbles, let dry 12 hours. Repeat. Cut paper to fit the top of the coasters. Apply Ultra-Seal to the back of the paper, let dry. Apply two coats of the Ultra-Seal to the front side of the paper, letting dry between coats. Apply Ultra-Seal to the wood coaster and add the paper on top, let dry. Place tape around coaster, with about 1/8” lip above the top of the coaster. Pour resin mixture on the coaster. Brush resin, if needed to the edges of the coasters. Blow on resin to remove air bubbles if needed, let dry 24 hours. Remove tape and sand the edges. I mixed them together for 2 minutes, then poured them into a new cup and mixed for another minute. 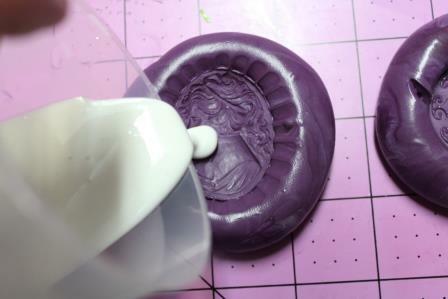 I sprayed the inside of the mold with Castin Craft Mold Release. Pour the mixed resin into the mold. Place the glass marbles into the mold and let it set for 6 - 8 hours. Mix up some more resin and pour into the mold, then add some more marbles and let set for 6 - 8 hours. 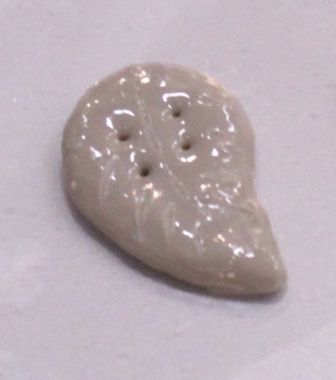 Mix a small amount of resin and add a drop of White Opaque Pigment, mix together and add to the mold. Let set for 12 hours and remove from the mold. The layers look great and there are so many possibilities...I am looking forward to trying! Hi everyone, Steph Ackerman here with a fun spooky treat dish. 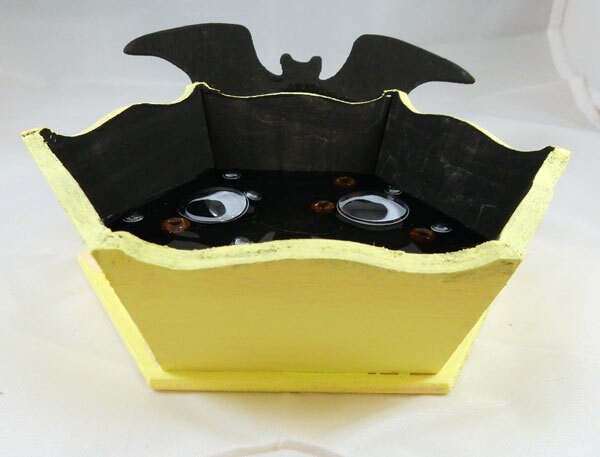 It's almost Halloween so why not create a fun project the kids will love.I painted a wood dish with Earth Safe Finishes Chalk It Up paint in Pear Compote and Licorice. I also painted a bat with Licorice and adhered it to the outside of the dish. 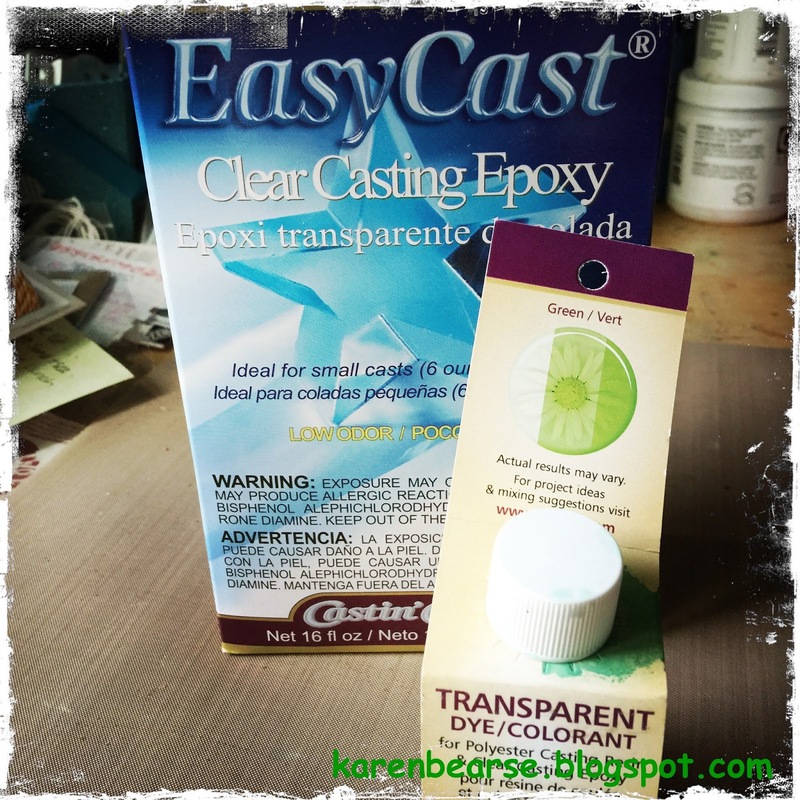 While waiting for the paint to dry, I mixed equal amounts of EasyCast Clear Casting Epoxy resin and hardener for 2 minutes. Next, I transferred the mix into a second container and mixed for another minute. I poured a light layer of EasyCast Clear Casting Expoxy in the bottom of my bowl then added in assorted sized wiggly eyes. Then I poured another layer on top. As the resin hardened, I also placed a few beads amongst the eyes. Wouldn't this be fun to put your Halloween candy in? 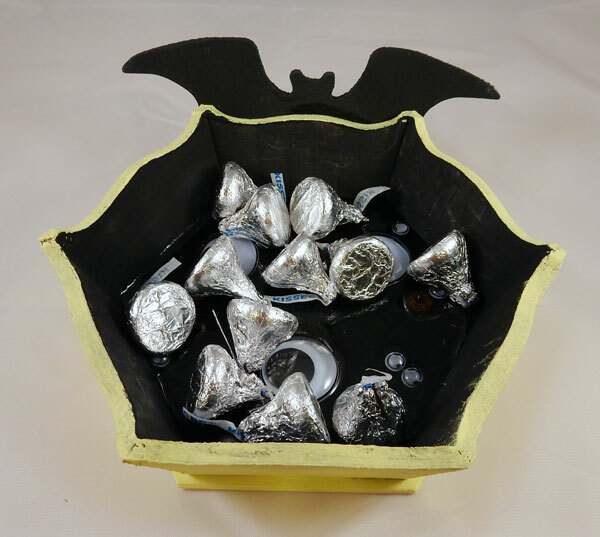 I'm sure the little one's eyes will go wild when they see the bottom of this candy dish! I love how the eyes appear to be floating in the resin.